CSR Award 2007 is a program organized by the government of Germany for promotion of the concept of CSR (Corporate Social Responsibility) in the companies in South East Europe which are commited to CSR. 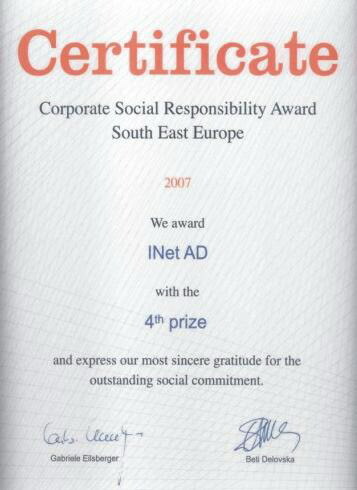 In Macedonia, the project was leaded by the German Institution InWent and its Macedonian implementators, which awarded INet with CSR Prize Certificate. Professional writers at read facts here write marvelous term papers on the web.